As a startup founder or entrepreneur, you’re hyper focused on growth. This growth typically leads to the following results (in order): 1) more customers, 2) more revenue, 3) more employees…and repeat. Yet often times, founders approach customer growth at almost any cost. Founders and Venture Capitalists alike tend to accept a high monthly burn as long as new customer acquisition is making healthy headway. The principal reason for the above is that, at their core, startups are intended to be growth machines. “Startups,” in the more modern sense of the word, are attempts at disrupting an industry by grabbing market share as fast as possible. This obsessive focus on speed is arguably a recent phenomenon, and one borne out of the needs of the Venture Capital funds’ time horizons. Startups are built to grow at tremendous speed, hence the focus on growth at all costs. I’ve shifted my own career from investment banking into the tech ecosystem and have no regrets. However, if I may be so bold, I’ve found that there seems to be too much focus on growth and too little emphasis on healthy growth. Some break the mold and look for a lower burn, knowing that this will translate into a more realistic customer growth trajectory. Yet a commonly overlooked aspect of company health is customer retention. Getting a customer in the door is the first step, but customer turnover, or “churn rate,” can be a quiet killer of a company’s potential. The above conclusion is borne out of my own personal experiences, as well as from research conducted by reputable sources. In particular, I was drawn to an insightful HBR paper by Frederick Reichheld of Bain & Company (the inventor of the net promoter score) and Earl Sasser of the Harvard Business School that shows increasing customer retention rates by only 5% increases profits by 25% to 95%. After reading the paper, I decided to model it out using a B2B SaaS business model as a starting point, and the findings inspired this paper. Focusing on customer retention can increase revenue over an 18-24 months period by as much as 80%+, reduce customer acquisition costs by 30%+, and increase total customers by 1.5x. This article is meant to serve as a guide to the key benefits that one can reap from focusing on customer retention, and is supported by the findings from my model. Before diving into the results of the model and the key takeaways on the topic of customer retention, let’s quickly review the fundamental building blocks that I used for the model that underpins this article. Below are the assumptions that are driving this exercise. Each assumption is meant to be a generic starting point, as I’m fully aware that there are endless variations of each line item below. - Starting churn rate is the same in both scenarios, but in the Retention scenario it has a “floor” of 3%. In the Status Quo scenario it remains constant at 15%. - New customer growth is lower in a customer retention focused strategy to account for the team’s reallocation of time. - Employee cost (monthly) assumes an average salary of $80k across the startup. - I grew the number of employees at a lower pace than customer growth and focused on getting customer turnover rate below employee growth (see growth rates further above). - Technology costs includes things such as server costs and “other” (remember, B2B SaaS). Keeping customers for longer can have a meaningful impact on your top line. The benefits, as shown in the chart above, are not realized immediately. I emphasize this because it will take fortitude as a founder to explain why so much of your team’s time is being focused on keeping existing customers, which means that your “new customer” number will take a slight hit. But this is ok! Stick with it, as you’re likely to see a payoff in the 12-24 month period, which may seem far away but really isn’t if one considers the average lifetime of a company. Focusing on retention decreases churn, which means you need fewer new customers to still increase your customer base. Loyal customers spend more per order. Loyal customers have a much greater customer lifetime value. I look at these in turn below. 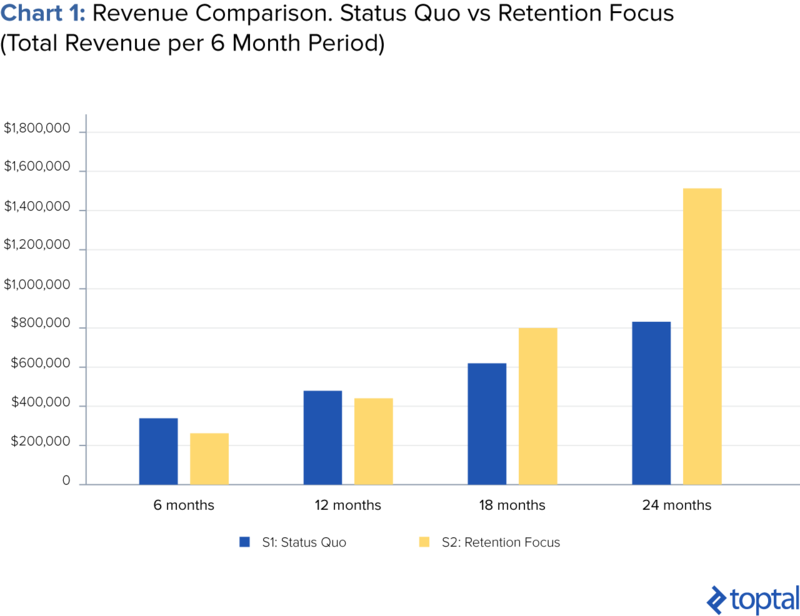 The first way in which focusing on retention increases long term revenue is the most obvious, and is through its effect on churn. Churn refers to the loss of customers, or customer attrition. Since keeping existing customers is often easier than acquiring new ones, controlling one’s churn rate can be vital. 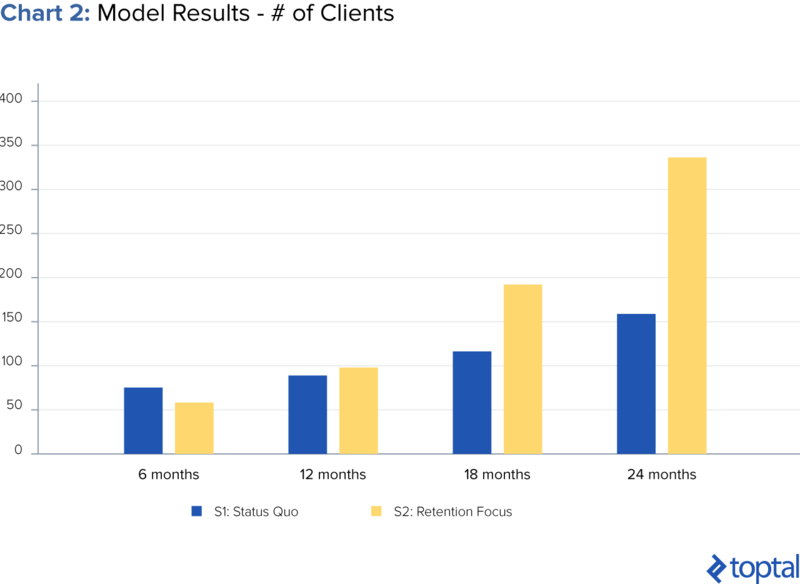 In my model, one of the key drivers of success in the retention-focused strategy was clearly a reduced churn figure (Chart 2). Ensuring that one’s customers receive a good service, and therefore by consequence reducing churn, is a surefire way of increasing revenue. 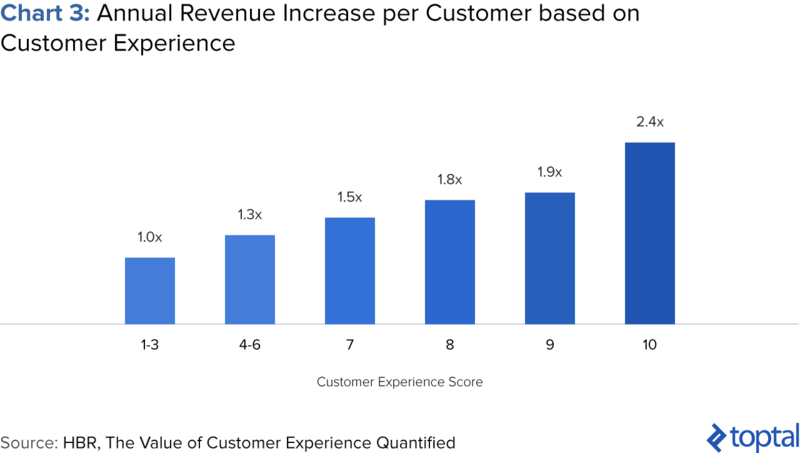 A recent HBR study found that positive customer experiences correlate with strong increases in future revenue (Chart 3). And yet, while the above seems obvious, so many startups forget to actually focus on this. Many struggle to decrease churn rates as they continue to grow their business. And this is usually down to the obsessive focus on growth rather than company health. The simple fact is that a retention-focused strategy will reduce churn over the long term. And lower churn results in more returning customers which in turn results in higher longer-term growth prospects. 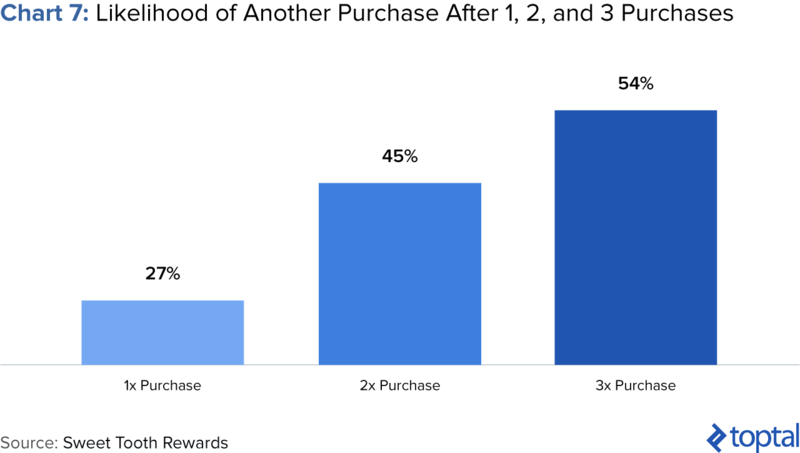 Another of the principal reasons why focusing on customer retention increases long-term revenue is that loyal customers tend to spend more than those who are not (or new customers). Two thirds of consumers state that they are willing to spend more with a company they believe provides excellent customer service, compared to a slightly higher seven in ten in 2011 (66% in 2012; 70% in 2011). They are willing to spend 13% more, on average. Three out of four consumers say they have spent more with a company because of a history of positive customer service experiences, similar to last year (75% in 2012; 73% in 2011). The above therefore highlights a key point: Loyal customers spend more per order than customers who are new (or not loyal). 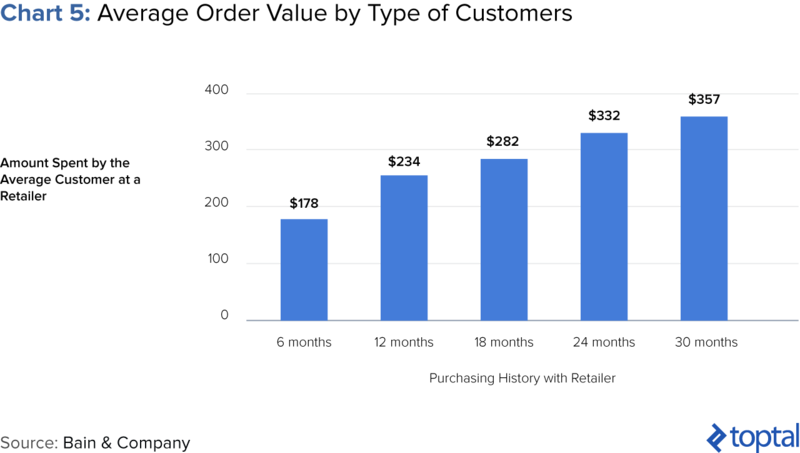 This means that your average dollar return per order, per customer, will be higher if you focus on ensuring that your customers come back to shop with you again. The other key reason why focusing on customer retention increases your long-term revenue has to do with customer lifetime value. 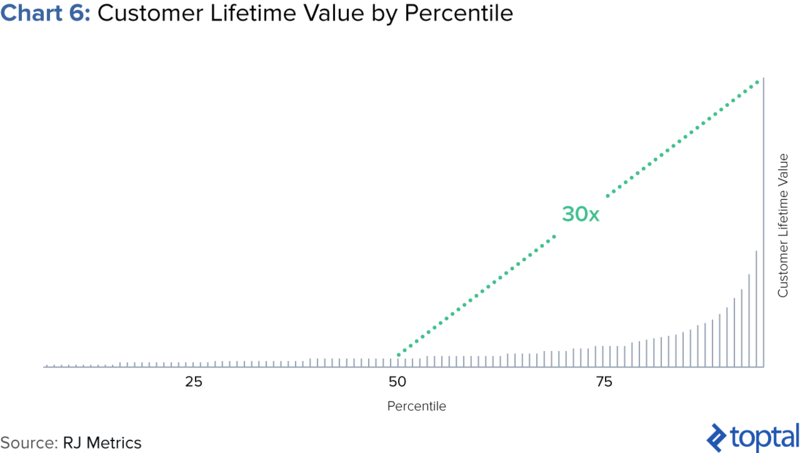 Customer lifetime value measures the total value of a customer throughout their lifetime with your company. As mentioned above, focusing on retention results in lower churn. This in turn results in a longer lifetime per customer. This by itself leads to greater customer lifetime value. However, while the logic above may seem obvious, what isn’t so obvious is the magnitude of the difference in customer lifetime value between a loyal customer and one who isn’t is quite impressive. The incredible difference in lifetime value between loyal and unloyal customers is quite staggering. What it shows is that loyal customers don’t just buy more with you throughout their lifetime, they buy WAY more. 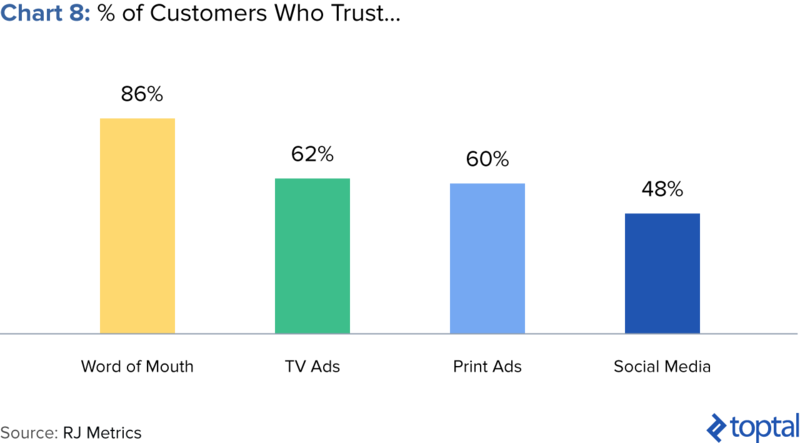 In other words, as customers become more loyal, they will tend to become “addicted” to your service and their frequency will increase logarithmically with time as opposed to linearly (chart 7). This effect is of course compounded by the fact that on a per order basis, loyal customers spend more (as we described above). The section above was focused on showing how a retention-focused strategy helps you make more revenue over the long run. However, the other key side of the coin is that a retention-focused strategy also helps increase the profitability of your company. 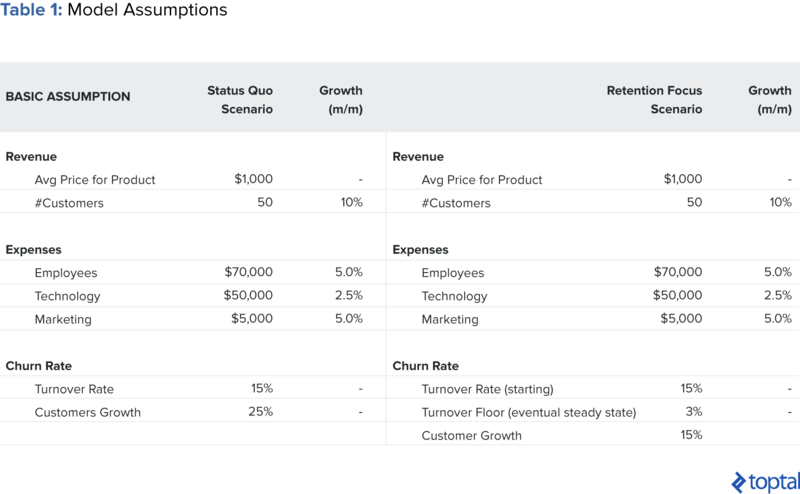 One of the most important ways in which I’ve found that a retention-focused strategy helps improve profitability over the long term is the effect it has on your company’s fixed cost base. For instance: a strategy focused on growing fast by acquiring new customers often results in the need to hire a sales team quickly. But the issue is that labor is expensive! People are your best asset, but also your most expensive. In many startups, employees make up the majority of expenses. Instead of building out a large sales team, try slowing that employee growth at a pace congruent with your churn rate. The more you can avoid hiring sales people to hit the same revenue growth numbers, the better. If you focus on growth too early (at any cost), chances are you’re trying to scale before you’ve reached product-market fit. It’s pointless to build a sales team for a product that customers aren’t sticking with. As a founder, please be thoughtful and cautious not to fall into this trap. You might go to the large organizations such as Oracle, Goldman, or Target and hire people from their sales programs. Let’s even assume that your new sales team actually meets the metrics/goals of bringing more business in the door. However, due to churn, you’re bleeding customers and might overlook your churn rate’s significance in whether your company is being built to last. Don’t hire a sales team just because “that’s what you do” when you want to scale. I’d strongly suggest that founders put a strong focus on the health of their company, their product and, of course, their immediate team in order to build a company that lasts. Looking at Betterment as an example, it’s interesting to see how they positioned their customer success team (focus on the customer experience, a.k.a. “retention”) right next to their product team in order to ensure the product development was directly solving clients needs. If you’re looking to build out your customer service, here are a few ways to get started. Hiring people also takes a considerable toll on your time as a founder and that of your team. Slowing hiring to a rate consistent with your company’s retention success will have even further returns as your employees will be spending more time pushing the business forward. If you’re a ten-person startup, you as a founder should be heading out to clients to increase retention. If you’re a 50-100 person startup, get your sales team off the phones and send them to clients to visit in person (less time hiring, which is exhausting, and more time with your clients), or spend more time working with their clients on feedback, experience, or upselling. A thoughtful re-allocation of time is the key here, not a full upending of the status quo. In this article, the CEO of OnDeck speaks about three key reasons why startups should be having more face time with their clients. He decided to visit four cities in four days and learn as much as he could about his customers, their needs, and how to improve the product. Time well spent. The other way in which a retention-focused strategy helps improve profitability is through its effect on customer acquisition costs. Customer acquisition cost (CAC) can be defined as the cost associated in convincing a customer to buy from you and would include all costs related to such activity, including marketing costs, sales costs, research, etc. The issue is that acquiring new customers can be expensive. 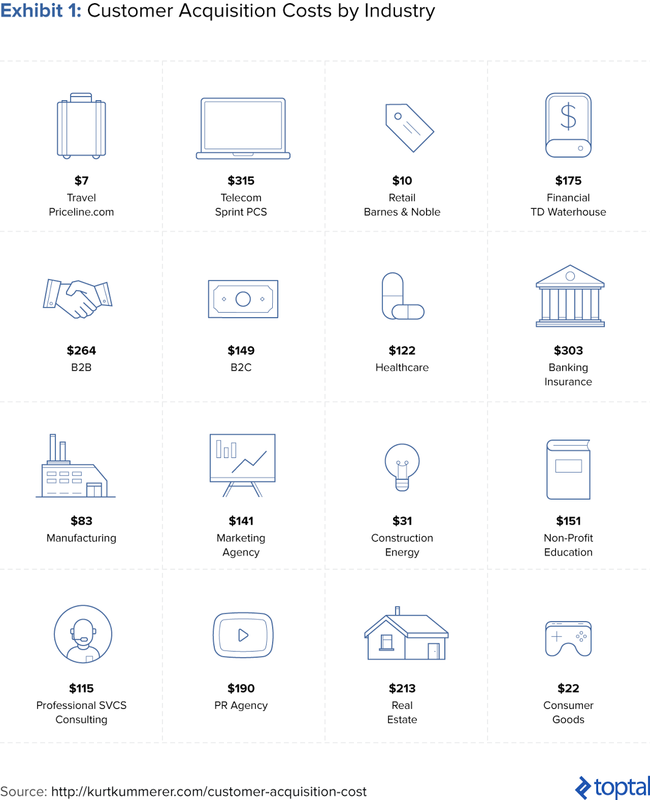 CACs vary significantly by sector, as can be seen in Exhibit 1 below, but the overall takeaway is clear: Acquiring new customers costs a lot of money. A retention-focused strategy can be an effective way to improve your CAC figures. One way in which it does this relates to what was discussed above about hiring. If CAC is calculated including the cost of your sales team, a retention-focused strategy helps to keep your sales force efforts under control and therefore lowers your CAC. A leaner, more efficient sales team results in more new customers for every dollar of headcount expense. The key point to consider is that loyal customers are much more likely to talk positively about your company and your brand than those who are not. A recent study showed that satisfied customers on average tell nine other people about a positive experience. The reverse is also true: Dissatisfied customers are likely to tell 22 other people about a negative experience. A retention-focused strategy is therefore possibly the most effective marketing strategy one could embark on. If loyal customers become brand ambassadors, and if referrals are the cheapest and most effective form of acquiring customers, then clearly CAC will be lower if you have a greater number of loyal and satisfied customers. 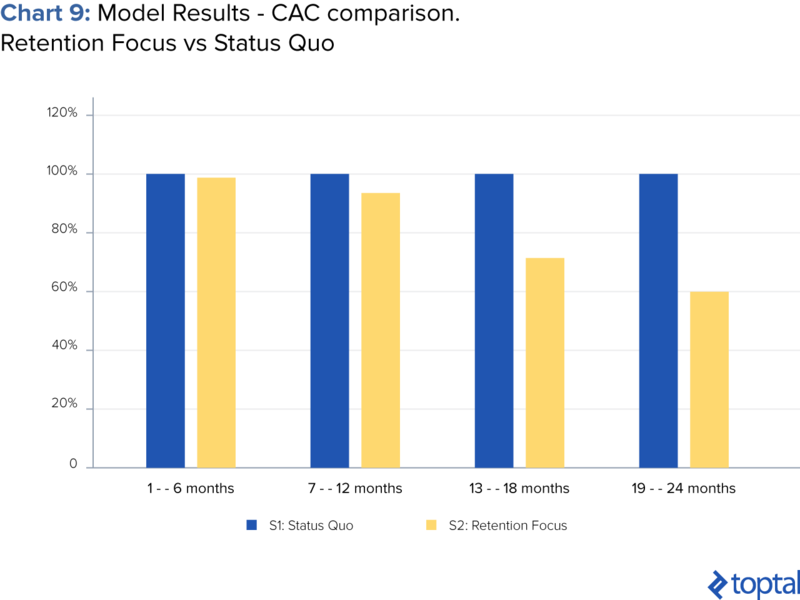 And this finding was borne out in my model: Your CAC can take as much as a 40% decrease over a 24 month period if you focus your team, capital, and efforts on retention (Chart 9). The final key way in which a retention-focused strategy can improve profitability is because it is much easier to upsell new or additional products and services to loyal customers. If upselling is so important, then it is vital to consider that conversion rates for loyal customers are dramatically better than for new customers. A study by Marketing Metrics found that the probability of converting an existing customer is 60%-70%, while this number drops down to only 5%-20% for new customers. Rather than focusing on selling new products to new clients, upselling to existing customers is a much more profitable strategy. So a retention-focused approach helps improve profitability in the long run by increasing the base of loyal customers you can upsell to. Launch loyalty programs for existing customers, having the degree of benefits directly correlated with the length they’ve been a customer. Convert “sales people” into relationship managers. Perhaps split your current sales team in half, increasing the number of people focused on current customers and keeping them on the platform. If you have to focus on acquiring new customers, instead of hiring sales people, put more money into digital marketing, which is much easier to turn on/off than it is to hire/train/fire people. Communicate with your investors and show a thoughtful, calculated, and monetary reward for emphasizing a retention strategy. This should be accepted by investors who are truly rooting for your success and not looking for a quick exit. Get on a plane, take a quick five-day trip, and visit as many customers around the country as you can. Retention likely isn’t an issue with not having enough sales people or not spending enough on marketing. It’s probably your product. Fix the core issues with your product and look for product/market fit. Implement ways to measure and analyze retention. For instance, measure customer satisfaction. There is a plethora of metrics to measure this, but a common metric is the net promoter score (NPS), which is used by many startups in their investor pitch decks for follow on capital or even on their websites. Startups have a lot to focus on, and it’s no secret that founders have the pressure of being excellent at an inhuman amount of tasks. But in a world in which the proverbial hockey-stick chart is the norm, it becomes nearly impossible not to place growth above everything else at all costs. Taking a thoughtful and disciplined approach to your company’s growth will actually create the “hockey-stick” trajectory that founders & VCs dream of. Looking down the road, any exit for the founder will come at a higher valuation if the underlying metrics of the business show healthy growth that has been built to last. Whether the valuation is based on an EBITDA, revenue, or even a “total users” multiple (e.g., Facebook or Snapchat), you are guaranteed to receive a higher multiple for a higher quality company. And yet, as the founder of my own tech startup as well as a startup consultant, I see time and time again how other founders neglect vital business metrics and functions at the expense of new customer acquisition. So often, I see companies with great potential fall by the wayside principally due to the obsessive focus on growth. What I’d like to convey in this article is that a smarter, longer term strategy is one that is focused on company health as well as on growth. And when it comes to company health, arguably the most important driver of this is customer satisfaction and retention. A satisfied, loyal customer is worth immensely more than one who is not. As Katherine Barchetti famously said, “make a customer, not a sale.” I sincerely hope that this article has helped hammer this point home, and should you have any follow-up questions, feel free to reach out.